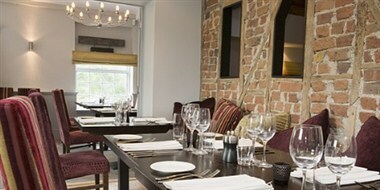 The 5 star Kent restaurant with rooms recently awarded a rising Michelin star. Perfectly positioned for exploring Dover castle and the White cliffs, and an ideal pit stop if you are using the Dover port or Eurotunnel to visit the continent. More luxurious than any Dover hotel you will find. The Marquis at Alkham is a fabulous new licensed restaurant with rooms which stands at the heart of the Kent Downs, in an Area of Outstanding Natural Beauty. The setting is stunning, and the venue is sublime. The public rooms are spacious, sophisticated and elegantly styled. The restaurant serves delicious cuisine with imagination and flair. Guest rooms are sumptuously appointed. And the exquisite, 13th Century Church of St Anthony of Pamiers - where you can also take your vows - is right next door. It's a wonderful setting for the perfect Kent wedding ceremony or wedding reception. A fabulous place for a small and intimate celebration - we hope you enjoy your big day. The Marquis at Alkham is an utterly unique and distinctive restaurant with rooms offering boutique style luxury accommodation in the heart of the English countryside. The styling is contemporary. The décor is chic. But look outside the window, and you couldn't be anywhere but England. Our five en suite bedrooms have views across the Alkham Valley, an Area of Outstanding Natural Beauty in the heart of the Kent Downs. The village's small and picturesque cricket pitch can be seen from most of the rooms. 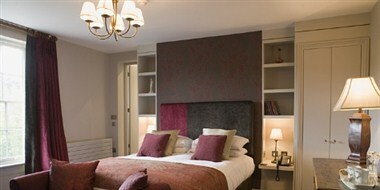 There's also a large two roomed suite with a sofa which converts to a double bed if required.